What’s your Chain of Events? Imagine cycling above and through vineyards with rugged mountains in the backdrop, with sparkling lakes and beaches within the vista. 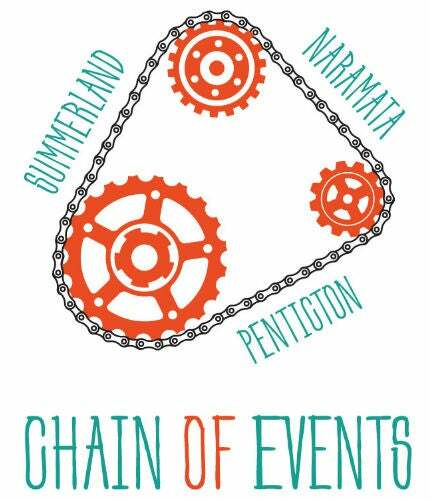 Here, it’s more than just a dream, it’s why cyclists from around the world choose to pedal their way through Naramata, Summerland and Penticton each year. With one of the best year-round climates in Canada the season is a long and enjoyable one. The communities offer an array of wonderful rides for cyclists of all abilities. Adventurous mountain bikers will find the Three Blind Mice single-track trails exhilarating. The Kettle Valley Railway Trail, with its gentle grades and breathtaking views, is perfect for a leisurely outing. It does not matter what age you are, what size you are or how fit you are – cycling is sport for everyone. Take a leisurely trail among the wineries, a rugged route down a mountainside, a challenging road race or spin your wheels at the local BMX park. Whatever your cycling needs Penticton can provide. We have top notch tour companies, rental shops, equipment providers, accomodations, cafes and craft breweries who are happy to accommodate you when you need a break. We also have a large trail map, bike repair kit and several bike racks right beside the beach in the heart of downtown. PACA is a non-profit, member-based organization that is run by volunteers. They have several excellent projects—one of which is an online, publicly populated mapping platform that uses PDFs, GPS and Google Earth files. SweetSingletrack.ca is a website that links to over 100 trails in the South Okanagan. It represents 67 chapters of a digital book and includes downloadable GPS and Google Earth files (maps, images and comprehensive trail descriptions). SweetSingletrack.ca is available in print—at Tourism Penticton and several local businesses—as well as online (including mobile app editions). A portion of SweetSingletrack.ca profits goes towards trail maintenance, signage and sanctioning. Bike Okanagan is an online resource for mountain bike trails in the North, Central and South Okanagan that is run and maintained by volunteers. It was started in 2014 and is still developing, but its growing quickly (as anyone can uploadroutes from their region). It also includes a listing of bike repair shops. Click, Bike, Hike is an online interactive resource that identifies regional biking trails (including details like the route surface, activities allowed on the trail, trail description, PDF map and nearby communities). Please note: the website uses a program called Silverlight and is designed to allow you to print maps and descriptions. Silverlight is not usually installed on smart phones, so it is best to access this site from a computer.